Having bagged the endorsement of former US president Bill Clinton, Indian American Democratic Congressional candidate from California, Ami Bera appears to have moved closer to victory. 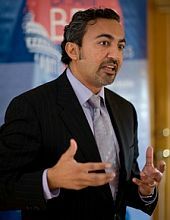 The independent Centre for Politics at the University of Virginia moved his seat (California 7th Congressional District) from a "tossup" to a "Lean Democratic" which means that Bera has now greater chances of winning the seat by defeating the incumbent Dan Lungren of Republican Party. "If there is one state where Republican House chances appear to be slipping, it's in heavily Democratic California, which is why we've added Representatives Dan Lungren (R, CA-7) and Jeff Denham (R, CA-10) to Representative Brian Bilbray (R, CA-52) in the 'leans Democratic' column, meaning we believe all three incumbents are underdogs in their battles to return to Congress," the Centre for Politics said in its report on Thursday. This new ranking comes as a further boost to Bera's campaign, which early this month was endorsed by Clinton and the popular daily newspaper Sacramento Bee from California. In the third quarter ending September 30, Bera added more than $731,000 to his campaign funds, and dramatically outraising his opponent Dan Lungren by more than $223,000. Bera, whose parents migrated to the United States from India over 50 years ago, has now successfully outraised Lungren for 12 out of the last 13 quarters and netted almost $2.7 million this cycle. Along with Bera, a record number of six Indian American candidates are in fray for the US House of Representatives. The other five are Upendra Chivukula from New Jersey, Ricky Gill and Jack Uppal from California, Manan Trivedi from Pennsylvania and Syed Taj from Michigan. Gill, the only Republican Indian American in the fray, according to political analysts too appears poised to make an upset victory over the three-time Democratic incumbent Jerry McNerney. Republicans are simply happy with the situation," political analyst Stuart Rothenberg wrote in the Roll Call newspaper listing it as one of the four possible upset Congressional seats for the November 6 elections. He raised $2.3 million during the campaign, as against less than $2 million of McNerney. According to another poll in Michigan, Indian American candidate, Syed Taj, a doctor, performed unexpectedly better considering that he is contesting from a Republican bastion. In the new polling released this week by pollster Mark Grebner of Practical Political Consulting, Taj received 47 per cent of the vote compared to 53 per cent for his Republican opponent Kerry Bentivolio. The poll's margin of error is five per cent. In the Rasmussen tracking, Taj is trailing behind by eight per cent. If recent polls are of any indication, Trivedi in Pennsylvania has a lot of round work to do to stop incumbent Jim Geralch from his fifth term in the Congress. In a Monmouth University survey Gerlach is having a comfortable 10-percentage-point edge over Trivedi, 54 per cent to 44 per cent. In the third quarter ending September 30, Trivedi, an Iraq War veteran and primary care physician, raised over $437,000 compared to Gerlachs's $333,000. In New Jersey, the Democratic Congressional Campaign Committee DCCC recently named the 7th Congressional district race to their candidate's list of emerging races, where Indian American Upendra Chivukula is giving a tough fight to his opponent the Republican incumbent Leonard Lance. Chivukula has been the Assembly's Deputy Speaker since 2007. The weakest of the six Indian American candidate is Jack Uppal, who is contesting from the 4th Congressional District in California, pitted against Republican incumbent Tom McClintock. This week he started running new a television commercial advertisement. Uppal has charged that McClintock's bad record on Medicare is one of the chief reasons the incumbent has refused to debate him, and has turned down all offers, including one made by the impartial League of Women Voters, to meet Uppal on the debate stage.